Online courses and MOOCs may be a poor substitute for in-person learning with a charismatic teacher, but they are light-years better than nothing, and are particularly relevant for higher education and specific skills, when students are self-motivated. 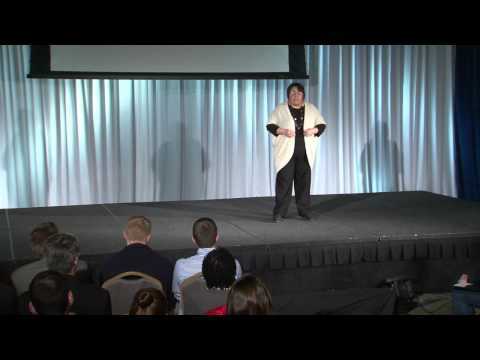 Universities, professional organizations, and educational nonprofits should keep these audiences in mind when developing new, free curricula. But as more and more of the population is online, particularly via mobile devices, there are real possibilities for online learning. In an extreme example, tiny Swaziland (landlocked within South Africa) has 1.2 million citizens, but only one university (serving <6000 undergrads, relative to ~120k young adults of college age). Like many countries in sub-Saharan Africa, Swaziland’s school system allows few students to advance to secondary school or college. Of the 20 kids in the above photo, maybe one kid will go to college. However, in 2011, 18% of the Swaziland population was using the internet. Could they learn online? Similarly in Asia, Bangladesh has ~150 million citizens. 43% of the population over age 15 is literate. There are 88 universities, educating 277k post secondary students — only 13% of the college-age citizens. Internet is used by 22% of the population (33 million people), mostly via their mobile phones. (Mobile internet is the only internet most places outside the capital Dhaka.) Can Bangladeshis learn meaningful skills online? Some could. If we make more online courses available. The education statistics in Sub-Saharan Africa and south Asia are particularly grim. College educations in Malawi, Niger, and Chad hover around 1-2%. Madagascar is 4%. This is highly correlated to the wealth of a country. 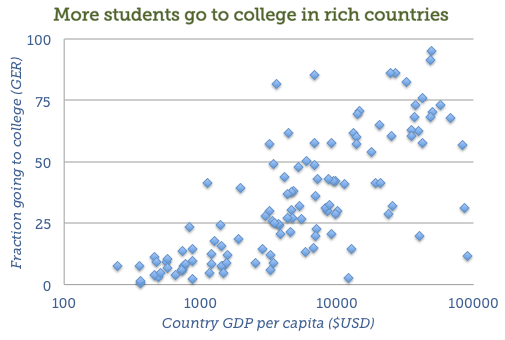 The overal diagonal trend is that richer countries send more of their students to college. Curiously, there are outliers, such as wealthy Qatar which has only 12% tertiary GER due to other social factors which suppress education in their society. 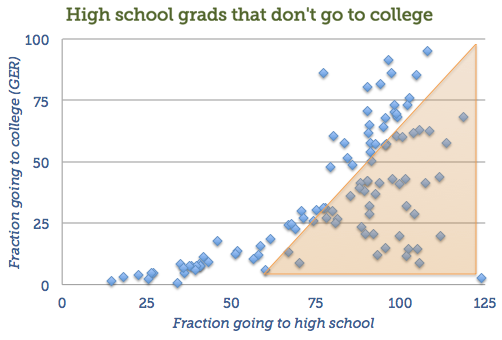 In the orange triangle above, potentially college-educated adults have their dreams squashed. For example, in the Arab world, 69% of society goes to high school and 23% to college; in developing sub-Saharan Africa, 41% of the population goes to high school and 8% go to college; in east Asia and the Pacific, 80% go to high school but only 30% go to college. Brazilian class using One Laptop Per Child (OLPC) computers. Of course, any dream that technology can conquer educational disparities needs a serious reality check. One of the more notable failures is the One Laptop per Child project, led by Massachusetts Institute of Technology’s Nicholas Negroponte. Despite their claims that by distributing $100 laptops, “we have seen two million previously marginalized children learn, achieve and begin to transform their communities.” In 2012, two separate studies — one in Nepal and the other in Peru — concluded that kids using the computers gained little or no benefit in terms of improved language or math skills or school attendance. But that does not mean we should not try. Cheap laptops, tablets, and internet-connected smart phones are proliferating at an amazing rate. More online courses, with substantial, meaningful content — delivered to these students online — can make a difference for increasing numbers of learners who otherwise lack any real options. The internet has demonstrated profound power to reshape societies, with social media fueling the protests of the Arab Spring. When classrooms are unavailable or limited, online courses are a huge deal. An online course has a clear curriculum, delivers content with text, audio, videos and/or interactivity, and provides some type of assessment. — And can potentially make a difference to millions. Source: Graph of tertiary enrollment and other stats from UNESCO. In the GER map, countries in white don’t have current statistics from the UNESCO Institute for Statistics. I think online course or study help those people who have to save their lot a time & money. There are many universities start quality of education to door step for any person. To use this modern technology we can get a lot of knowledge to pay minimum cost. This study is also helping those people who are working as job in morning and study through internet in evening.